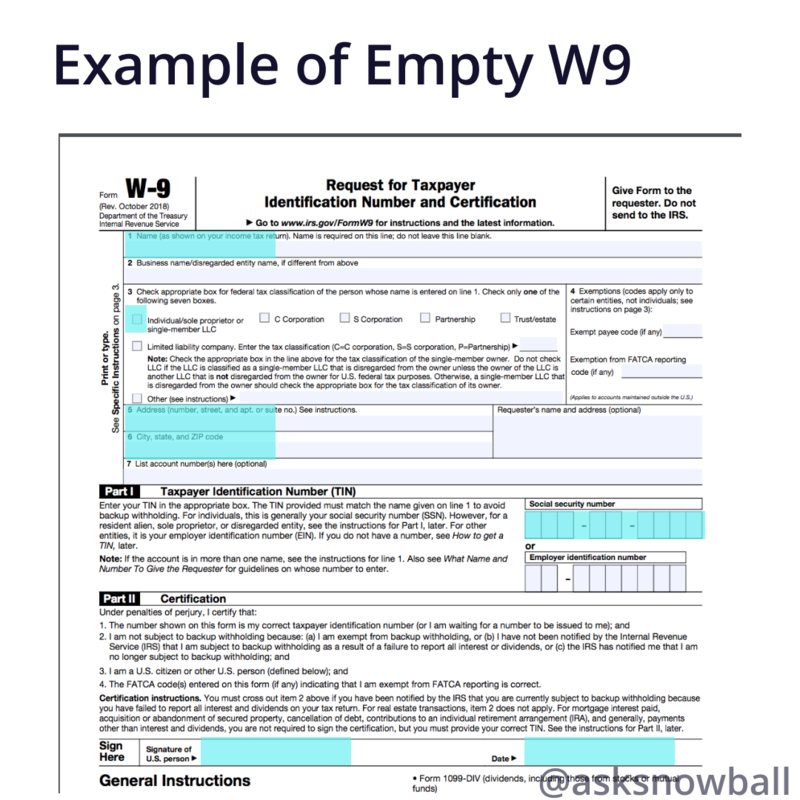 What is a W9 form used for? Issuing the 1099 to employees, as they should be receiving a W-2 Form instead. Issuing 1099s to a corporation. Only independent contractors need a 1099. If you have hired a corporate business for a service, then a 1099 is not necessary. Make sure the W-9 is the correct form for you. Any client that hires you as a freelancer or independent contractor has the responsibility of providing you the W-9 form. In box 1, provide your full name. In box 2, provide your business name if you have one. Otherwise, leave this blank. In box 3, check the box that best describes you or your business. If you are filling this form out for yourself, check the individual box. In box 4, complete only if you have an exemption code. For an individual, this will be left blank. In box 5 and 6, fill out your complete address. In box 7, it is optional to fill out. You only need to fill out this section if your employer needs an account number from you. Move on to Part 1. If you are an individual, go ahead and fill in your Social Security Number. If you are a resident alien, sole proprietor, or disregarded entity, use your Taxpayer Identification Number. For other entities, provide your employer identification number. Sign and date the form. Once you’ve filled in all the required information and signed the form, you can give this form to your client. Remember that a W-9 form is required for every client for whom you’ve completed work for, and make sure every request is legitimate. 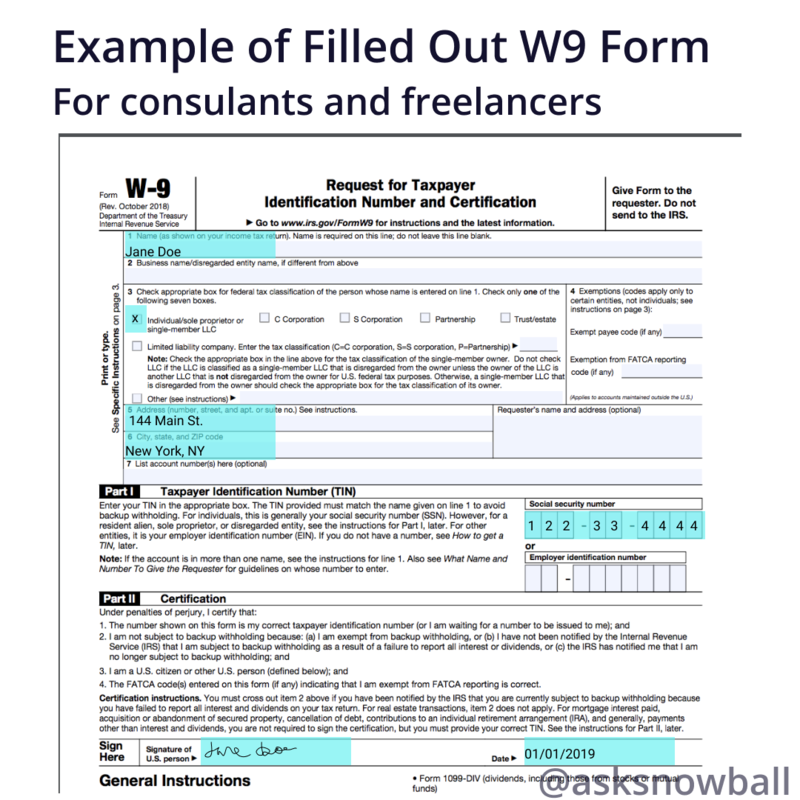 What Does a Filled out w9 Look Like? When do I use a W9? The best time to get a W9 is when you first start working with your independent contractor to ensure that you will have the information needed to complete the year-end 1099 if you have paid them over the minimum reporting requirement. Is there a minimum required to report? Yes, the minimum required to report is $600. If you pay a freelancer or independent contractor under $600 during a tax year then you do not need to fill out a W-9 form. However, if you pay them more than $600 then you are required to report it the following year. Does the IRS need the W9 Form? When your contractor provides you a W9, you should keep a copy of it in case you are audited. This shows that you’ve asked for the correct information from the taxpayer. The IRS does not need a copy of this document. How do I know if I’m subject to backup withholding? If you have not received a letter from the IRS that states that you are subject to mandatory backup withholding, then you are not subject to any withholding. However, if you have received a letter then you will need to cross out item two in part two of the W9 Form. The form is relatively straightforward. It requires a name, address, and either a Social Security Number or Employer Identification Number. I have an Employer Identification Number and a Social Security Number, which one should I provide on the form? If you are the sole proprietor than either number works but if your business is an LLC, a corporation or a partnership, you should use the entity’s Employer Identification Number. If your business is a single-member LLC then you can use either your own EIN or SSN. What if I refuse to submit a W9? If you do not submit a W9 when a business sends a legitimate request, then you are subject to backup withholdings up to 28 percent on your payments. As a reminder, always make sure that each W-9 request is legitimate to avoid scams and identity theft.